Cyclodextrins: Properties and Industrial Applications is a comprehensive resource that includes information on cyclodextrins (CDs) structure, their properties, formation of inclusion complex with various compounds as well as their applications. 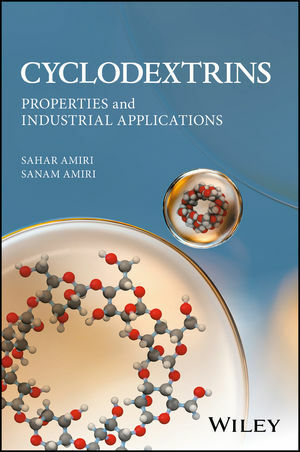 The authors Sahar Amiri and Sanam Amiri, noted experts in the field of cyclodextrins, cover both the basic and applied science in chemistry, biology, and physics of CDs and offers scientists and engineers an understand of cyclodextrins. Cyclodextrins offers research scientists and engineers a wealth of information about CDs with particular focus on how cyclodextrins are applied in various ways including in drug delivery, the food industry, and many other areas. SAHAR AMIRI currently works at the Department of Polymer Engineering, Science and Research Branch, Islamic Azad University, Tehran, Iran. Her research interests include synthesis and characterization of polymers, including silicone-based polymers and copolymers, cobalt-mediated radical polymerization (CMRP), inclusion complex between Cyclodextrins and various polymers and nano-capsule synthesis based on cyclodextrins. She has authored 2 books and more than 35 papers to date. SANAM AMIRI works at Department of Textile Engineering, Amirkabir University of Technology, Tehran, Iran. Her current research interests include synthesis of polymers including silicone-based polymers and copolymers, cobalt-mediated radical polymerization (CMRP) and using Cyclodextrins in textile engineering and thermos-reversible lock copolymers based on Cyclodextrins.